Cozmo bats his eyes — two pixelated blobs on the surface of a LED screen, no bigger than a watch face — as he awakens in his charging station. He lets out a yawn that sounds like it came from an auto-tuned WALL-E, and rolls away to explore the world around him. “Now let’s see what he does,” says Hanns Tappeiner, one-third of the founding team of Anki, while we sit in the robotics company’s San Francisco headquarters. He watches with a smile. 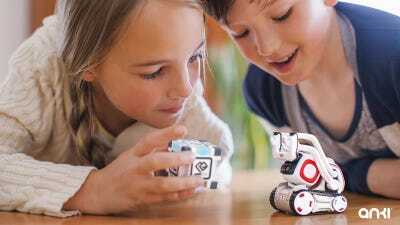 Cozmo is a new consumer-grade robot, intended for children age seven and up as well as kids at heart, that combines animation and artificial intelligence to generate the personality of something you’d see on the big screen. 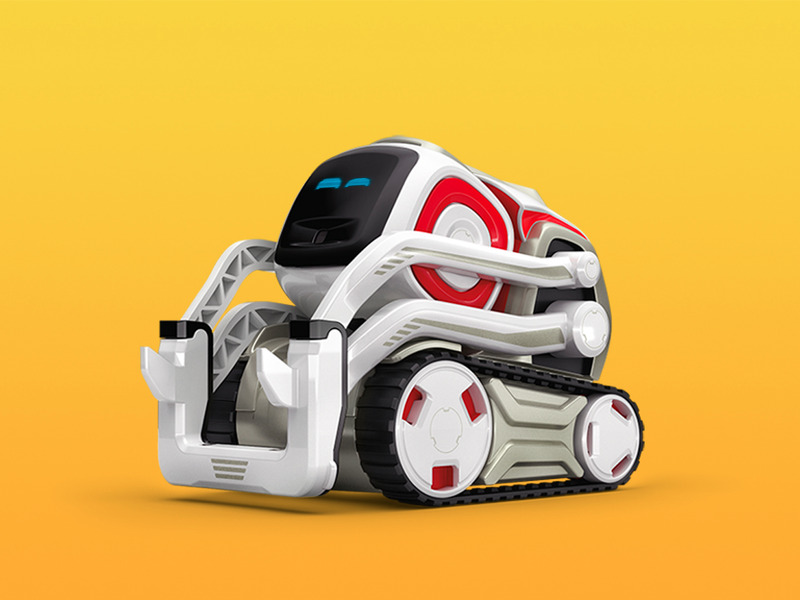 Game developers, AI gurus, and former Pixar animators worked together for nearly half a decade to bring Cozmo to life, making him as smart as he is cute. Cozmo remembers who his playdates are and can call them by name in a room full of people. He’s aware of his surroundings, so he won’t fall off a table. He picks himself up when he falls, and returns to his charging station when he’s tired. It’s like having a puppy, with less maintenance. 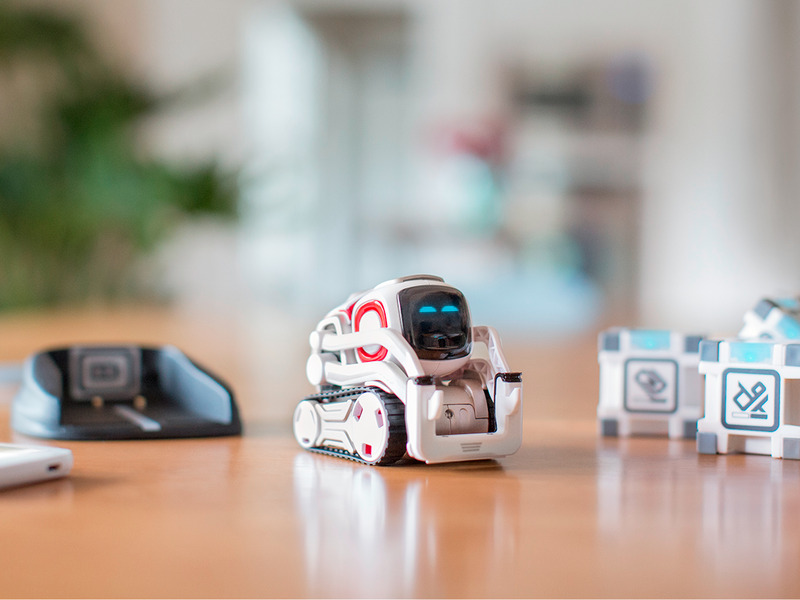 Anki prototyped 45 versions of Cozmo before landing on the product that hits stores in September. Standing just a few inches tall, Cozmo looks like an old iMac computer stacked atop a forklift. He’s white with red and silver accents. Two arms hang in front of his face, allowing the robot to pick up objects and interact with his environment. What’s under the hood is far more impressive. “In order for the robot to feel like a character, at the base level, he needs to understand exactly what’s happening around him,” Tappeiner says. When Cozmo wakes up, a camera looks around to find objects that the toy’s internal artificial intelligence classifies as landmarks. The system computes Cozmo’s position relative to those landmarks, which can be anything from the edge of a desk to a human face. He’s then free to navigate his environment. When a person enters Cozmo’s field of view, the AI scans for certain facial recognition metrics, such as the distance between the eyes and the curvature of the mouth. Cozmo stores these metrics and uses them to identify people he’s met before. Though that information is stored in the robot’s hardware (or “Cozmo’s brain,” as Tappeiner says), most of the processing happens inside the user’s phone, which connects to Cozmo via Bluetooth. The robot’s battery lasts for 90 minutes of playtime and charges in six to eight minutes. The first time I met Cozmo in Anki’s headquarters, he asked me (through a notification on the app) to play a game called “tap-tap,” which involved tapping small white “power cubes” when they lit up at the same time. The phone kept track of the score. I let Cozmo win, though it wasn’t easy. He celebrated with a victory dance, swinging his arms overhead and chanting a conga-line beat. Tappeiner explains that Cozmo remembers how long it’s been since someone has played with him. He knows what games he played yesterday and whether he won or lost. That history affects his behaviour. Nothing is randomised. Instead, the robot “gets in the mood” to do things, like stack blocks, be held, or take a nap. If his battery starts to run low, his urge to return to the charging station overrules his desire to play a game, for example. Cozmo expresses these desires through eye contact, gestures, and notifications in the app. In the early development days, Tappeiner and his cofounders — who met at the prestigious robotics institute at Carnegie Mellon — learned that a sense of character was an important part of making a successful toy. They tried to give each toy car its own unique personality, through sound effects, behaviours, and skills. But they also discovered a Lamborghini loses its coolness when there’s a Pixar-like face drawn on the windshield. Eventually, that led to the creation of a companion robot. Cozmo will cost $179 when it launches this fall (about $50 more than Sphero’s animatronic BB-8 toy). The company hopes to one day develop an entire ecosystem of robotic toys that interact with one another. Cozmo might have friends with complex and special personalities, just like Barbie and Transformers toys.